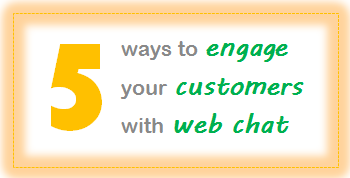 Popping up a web chat box on your website works best when it is targeted to users who are most likely to need help. Initiating a chat session with every user not only creates an atmosphere of intrusiveness, alienating some customers, but also is very costly and often a wasted effort. The key is to be proactive rather than pushy, and relevant rather than random. Let’s look at some best practice strategies to give customers value out of the outbound web chat channel. Chat invitations should be friendly and professional, with a specific objective to help – so for example, if someone is on the registration page for an unusually long time, it’s more effective to ask the user if they need any help with the registration process, rather than an open-ended question, “Is there anything I can do for you today?” The more specific and personalised, the greater chance the customer will appreciate the engagement. Target chat invitations to those who have already sent buying signals – eg. they are on your checkout page! – but haven’t submitted their purchase. There may be a reason for this which an agent can address. A common issue with online retail is that customers are surprised and put off by shipping costs, which appear at the last minute. Here the web chat agent can be armed with special offers to ensure this is not an obstacle to the sale – for example, by applying a first time customer promo code, the customer might be able to offset the shipping costs. Or the agent may be able to offer a discount towards the next order, to encourage loyalty and tip the sale across the line. Different customers will be incentivised in different ways, so it is worth testing a variety of incentives to establish patterns of success. Help the customer faster and at the first contact – if the call centre has long wait times, pre-emptively advise customers lingering on the “Contact Us” page and offer chat as an instant source of assistance. Prioritise “at risk” customers where there is a high probability of frustration. For example, a user may be getting nowhere with FAQ. Either using pre-defined business rules (in a high volume environment), or with manual intervention in a low volume environment, web chat agents can jump in to turn these visits around into positive customer engagements. In a B2B setting, where the value of the sale is high, the agent can offer to schedule a live demo with a sales person, or send a link to a video demo of the particular product or service. Don’t stalk users – if they have already rejected an invitation to chat, respect their privacy and don’t issue repeated invitations. Just as with other channels, customers should be able to opt out of contact. Use chat to show you care, and solicit feedback on the user experience in the process. When done well, outbound web chat has huge benefits for customer engagement: proactively solving customers’ issues or “blockers”, offering value with unexpected, tailored marketing offers and creating a positive brand impact. Web chat etiquette training services. Did you enjoy this article? Please share by clicking the LinkedIn Share icon below!